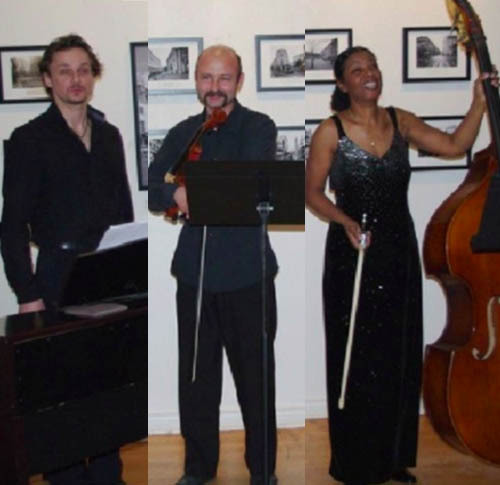 The Hassiba Classic Trio performs at the Opening Concert for Francophonie en Fete on Friday September 21st. The concert will be held at the Distillery District and is part of the Free Weekend Concert Series. The Hassiba Classic Trio is a young Canadian group made up of former students and laureates of the Russian Conservatories in Minsk and Odessa, where they met during their classical training. Rouslan is the violinist, Danyl the pianist, and Hassiba plays double bass. They are a trio of virtuosos whose classical repertoire fascinates and arouses attention as much as admiration. Still little known to the general public, the group regularly plays public and private concerts. Last year their show at the Alliance Française, for the anniversary of the birth of Mozart, was a big success. Adding strings to his musical arch, the Hassiba Classic Trio has diversified by playing jazz, experimental music, and modern scores. Their shows are aimed at all audiences, from the smallest to the largest.